Monosem Single Row Vacuum Planters give unmatched seed singulation. The patented brass singulator, in conjunction with the stainless steel seed disc, is the industry standard for singulation and accurate seed spacing. The original precision vacuum planter. 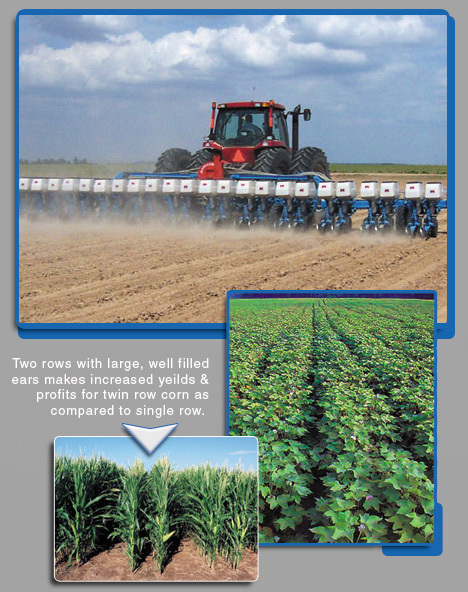 The Monosem Twin Row Planter system allows for the best, most precise twin row planting. Twin rows canopy quicker to conserve moisture and reduce weed pressure. 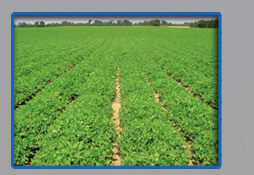 University Studies have proven that twin row planted peanuts have less tomato spotted wilt virus and higher grades. Yield data indicates a 10-15% yield increase for twin row agriculture as compared to conventional single row farming. Twin row cotton has an upright, flat topped growth pattern. Fruiting occurs near the top of the canopy, reducing the likelihood of boll rot. Monosem twin row cotton farming also allows the ground to be shaded more quickly than single row cotton, which helps to conserve precious moisture and reduce weed pressure. Two full rows with large, well filled ears, makes increased yields and profits for twin row corn, compared to single row corn. All Monosem Twin Row Planters (seeder) models are available as a mounted or pull-type model. Row spacing is 30" to 40" with 7-1/2" or 9" between the twin pairs. Today Monosem twin row planter sales are better than ever. Specialty Sales Co. is an authorized Monosem dealer with genuine Monosem Planter Parts. You can't find a better place to buy quality, twin row planters and parts. Service on our units and parts is unmatched in the agricultural technology industry. Call or email us today and experience twin row farming at its best.